HomeBusinessFrance’s Weak Economic Performance: Sick of Taxation? France has recorded one of the lowest real per capita income growth levels in the OECD over the last 20 years or so. One of the many structural weaknesses causing this weak performance is the French tax system. This column argues that complexity, instability and non-neutrality coupled with very high effective tax rates in many areas of the French tax system put a heavy burden on the economy. France is often labelled these days as one of Europe’s problem children (The Daily Telegraph 2013, Handelsblatt 2013). Indeed, France is one of the OECD countries which has recorded the weakest real per capita income growth over the last two decades or so (Figure 1). This weak economic performance can be explained by the country’s structural weaknesses in many areas, including taxation. The high tax burden (43% of GDP in 2010) and the structure of the tax system weigh heavily on the economy. Figure 1. Real GDP per capita growth in OECD countries, 1990-2011. In order for a tax system not to penalise economic activity excessively, three guiding principles must be borne in mind: simplicity, stability and neutrality (Mirrlees Review,2011). Yet France’s tax system is very complex and includes a great number of deductions, credits and exemptions. This complexity makes tax compliance burdensome for economic agents and increases the costs of tax collection. Furthermore, the tax system changes often. In fact, stability is desirable to minimise administrative and compliance costs and to reduce the negative effect of policy uncertainty on investment and saving decisions. Finally, the French tax system is not neutral with regard to household consumption decisions, the types of savings chosen, investment decisions nor whether current income is consumed now or in the future.1 Effective marginal capital income tax rates vary substantially across different asset classes (financial savings, real estate, etc. ), distorting investment and financing decisions (Table 1). A number of savings vehicles benefit from preferential tax conditions, even though some of these tax expenditures were scaled back in 2012. Gains stemming from share savings plans (plan d’épargne en actions, PEA) are exempt from income tax (but not from social security contributions – contribution sociale généralisée) if assets are withdrawn after five years. Workers’ voluntary savings plans at the company level (plan d’épargne salariale) also enjoy tax breaks and are subject to reduced social levies. Income from savings in the form of life insurance is taxed only when capital is withdrawn and at lower rates after eight years of possession. Finally, a number of savings deposits (livret A, livret d’épargne-populaire, livret d’épargne-logement, plan d’épargne-logement, livret jeune, livret d’épargne-entreprise, livret de développement durable) are exempt from tax and in some cases not subject to social levies. The recent increase in the ceilings of livret A and livret de développement durable accentuates the existing distortions. The absence of neutrality for investment in housing is also an important issue: taxing income from renting real estate but not imputed rents encourages home ownership. The prevailing statutory rate of the corporate-income tax is among the highest in the OECD: only Japan and the US have higher statutory corporate income-tax rates. At the same time, tax revenues from corporate-income tax, measured either as a share of GDP or total tax revenues, are low (Figure 2) because of the large number of loopholes and tax breaks. The effective tax rate is indeed much lower for large firms than for small and medium sized enterprises. All this implies a considerable dispersion in effective tax rates and higher statutory rates. Source: OECD, Revenue Statistics 2013; Ernst & Young (2011). There are a multitude of goods and services benefiting from reduced VAT rates, which favour unduly specific products and sectors such as restaurants and catering and are difficult to justify on distributional grounds. For instance, fois gras and bread are subject to reduced VAT rates and so is water consumption, which can be used to fill a swimming pool. This form of untargeted redistribution is costly for public finances. The same outcome in terms of income redistribution could be achieved more effectively through a uniform VAT rate, lower than the current standard rate, going hand in hand with means-tested lump-sum compensations. For the less affluent, the impact of an increase in reduced VAT rates would also be limited because many social benefits are indexed to inflation. The structure of the French tax system induces serious distortions: capital and labour are taxed heavily, thereby discouraging investment and penalising employment (Arnold et al. 2011). The integration of capital income into the personal income tax schedule will increase top marginal tax rates and amounts to a double taxation of labour income. 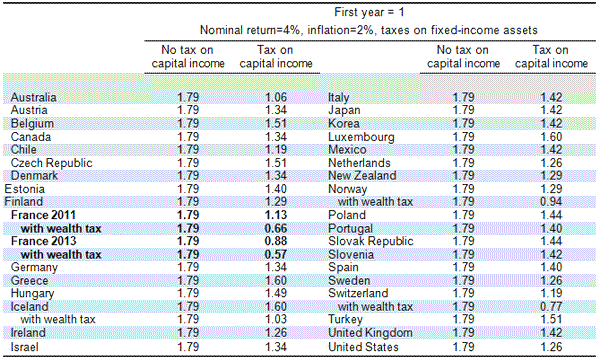 Many (Nordic) countries have therefore opted for capital tax rates that are lower than those on labour income. France is one of the few OECD countries that levy taxes on net wealth, which could be considered as an additional tax on capital income. For instance, a 1% tax on the asset stock would correspond to a tax rate of 25% on the nominal return and 50% on the real return, under the assumption of a nominal return of 4% and an inflation rate of 2%. 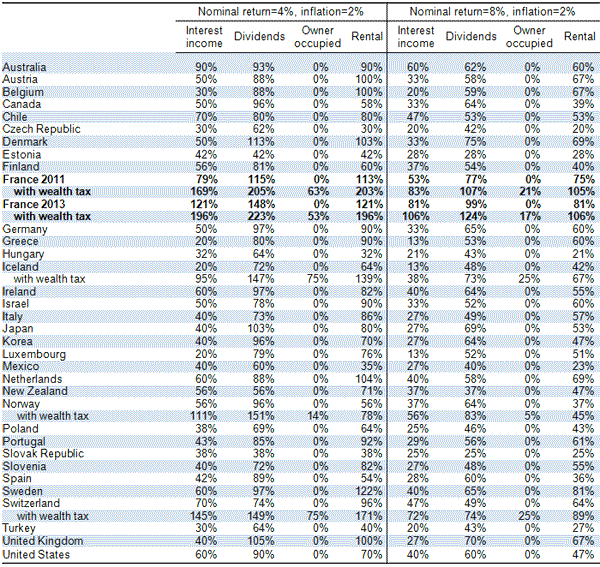 Table 1 below shows that net wealth taxes almost double the maximum effective tax rate on capital income. For those taxed at the marginal rate of 45% (41% in 2011), the top marginal wealth tax rate in France generates effective tax rates of close to 200% for interest income, dividends and income from rented dwellings. In practice, however, there exists a wide range of marginal effective tax rates because of the many loopholes, especially those for savings products. Note: Returns are assumed to be realised through capital income and not through capital gains and that the top marginal rate of the income tax schedule is applied unless there is a withholding tax or if no taxes apply at the personal level. Tax breaks on various asset types are not taken into account. The effective tax rate on dividends includes corporate and personal income taxes and social security contributions. For owner-occupied housing, local property taxes are not included. France’s effective tax rate on owner-occupied housing accounts for the fact that only 70% of the value of the property enters the tax base. The PIT marginal rates of 41% (2011) and 45% (2013) are used for France. In other words, if taxpayers subject to the highest marginal rate of the net-wealth tax decide not to consume today but to save and consume their labour income 30 years later, the real value of their savings and thus their purchasing power will be more than one third lower at that point. By contrast, with the earlier assumptions, the real value of their savings would increase by more than 10% in the absence of the wealth tax and by 80% if there were no capital-income or wealth taxes. France’s capital-income tax on deferred consumption and the combination of capital-income tax and wealth tax are the steepest in the OECD for high-income earners (Table 2). Note: The calculations follow the methodology used by Denk (2012). The index on the real stock of savings shows the evolution after 30 years compared to the first year where the index = 1. Top marginal tax rates (where applicable) are used for the calculations. While the tax base of the income tax is narrow because of the numerous tax expenditures, the marginal tax rate on labour is high. The total tax burden (taxes and social contributions) represents more than 40% of the cost of labour at the median wage, which is one of the highest in the OECD (Table 3). This high tax wedge reduces both the demand for and labour supply of the workers concerned. The Employment Competitiveness Tax Credit (at the heart of the 2012 competitiveness pact) implies a drop of more than 4% of average labour costs for workers paid up to 2.5 times the minimum wage. However, the tax wedge still remains above the OECD average. Note: MARG and AVE denote the marginal and average tax wedge, respectively. •Arnold, J M, B Brys, C Heady, A Johansson, C Schwellnus and L Vartia (2011), “Tax policy for economic recovery and growth”, Economic Journal 121(550), 59-80. •The Daily Telegraph (2013), “Germany accuses France of being `Europe’s biggest problem child`”, 30 April. •Denk, O (2012), “Tax reform in Norway: A focus on capital taxation”, OECD Economics Department Working Papers No. 950. •Égert, B (2012), “The efficiency and equity of the tax and transfer system in France”, OECD Economics Department Working Paper No. 1038. •Handelsblatt (2013), “Berlin erklärt Frenkreich zum Problemfall”, 30 April. •Mirrlees Review (2011), Tax by design: reforming the tax system for the 21st century, Institute for Fiscal Studies, London. 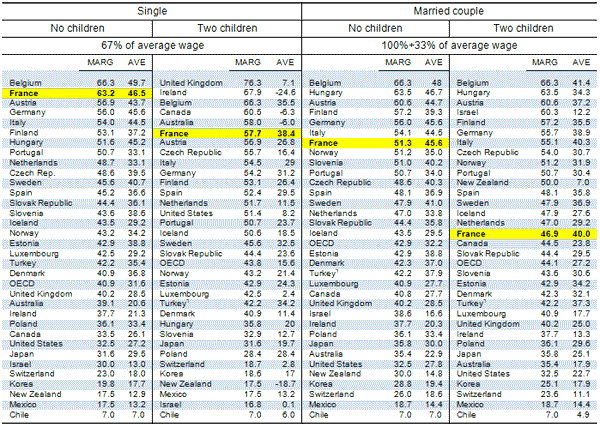 •OECD (2013), Economic Survey of France 2013, OECD Publishing. 1 Nevertheless, non-neutrality is desirable in the presence of externalities, such as those generated by environmental pollution or innovation. What Would Happen if S&P Downgrades the Eurozone?